Bob Gill - Gill has designed for Apple Corps records, Rainbow Theater, Universal pictures, queen and High times magazines and the United Nations. Sudharshan Dheer - Indian Iconinc Graphic Designer - Author of "The World of Symbols/Logos & Trademarks-India"
I don't want to exhaust you with too many info. Probably you will get confused, so that's why I will stop adding more materials on this page. But in case if you feel like you need more info, just let me know by dropping comment below, so that I will consider adding more of these kind ........ further.......later. sir, the earliest logo of Federal Express (FedEx) was created by Richard Runyon and the current version of the FedEx logo was designed by Lindon Leader of Landor Associates. Although I learnt that Landor was also involved in their company Logo design, yet yours is precise! But, Wasn't the United Nations Logo designed by Donal McLaughlin??? i have read ths n much more about logos and their designers from this site- http://famouslogos.net...ths isa vry useful site for uceed aspirants..one must go through it..
welcum sir, my plsure...n thnks 2 u too for the solutions of uceed 2015 ppr!! That's a good site for logos!!! its like that random quiz in 3 or 4 min where u hv to guess the logo, and then move onto next quiz!!! found it usefull and thought of sharing it!! has some of MF Hussain's paintings all-in-1!! also helps in understanding his approach!! Sorry I wont be able to put all o' them in a single comment, so they will come in individual ones!! got all o' them together!! Is it necessary to memorise the paintings made by famous artists? PDF of them are not available although posts for individual topics are well available in this bog. You can check CEED/UCEED resource page for logo collections and painters details. Better study the latest and the first most logo designer for such brands where that brand have multiple logo designers. the website is now Chermayeff & Geismar & Haviv ! Yes Saurabh, GA is never ending like sky, anyway as a revision, chk the topics that I listed in this post along with D'Source pages links that I provided in Resource update-2 as shared today in SYL FB timeline. My last minute tips for UCEED friends!! Do I need more materials for uceed 2017 .. ? If yes then please add as much as possible. I'll keep sharing whatever I find! I want NID previous years exam papers. unfortunately, its not available anywhere in the web as far as I know. Otherwise, I would've given more materials for NID. thank u very much, sorry couldn't chk ur comment earlier for approval. yes. Better to cover them too. add some links and questions related to product design and also on poster. Thank you very much sir. I have no words to explain how much stuffyoulook has helped in preperation for NID DAT and UCEED. Once again thanks a lot for your help! Please can u upload more information?! Hello sr.. I want to crack nid entrance exam.. . I have seen your blogs... Sr I'm confused... Plzz help me sr for actual preparation for nid..
what's ur confusion brother, let me know. 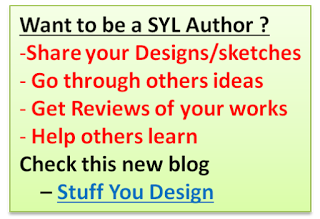 If you don't prefer to write here, reach me thru syl fb page or my fb. Please write about logos of banks govt logos and many more designers also if possible! Seems like you've just started going thru this blog. Take time and just explore the blog and that might help you find answers to the queries that u were looking for. Sir i would like you to talk to you personally so where should i contact you! As u knw, UCEED has vast topic and Gk on products is one among of them. But if u spend time deeply studying in one topic itself that consumes much time, then u might not get time for others. There r some topics which need to be studied or prepared for sure and they need prior prep not like one night study, like for ex. non verbal part etc. focus more on them n if u get time in between give a quick review of products and their latest availability on the market. Like which design product is used for what purpose - at least that level. This is Govind from Chhindwara and love your blog. Sir i m in need of some more data regarding Indian sculptures. will really like your help.